The Trust for Public Land has received a $50,000 grant from Gulf Coast Community Foundation to help extend The Legacy Trail into downtown Sarasota, the trust has announced. The money will be used to support appraisals, boundary surveys, environmental assessments and other expenses needed to advance the proposed acquisition of approximately 7.5 miles of rail corridor needed for the project, a news release says. 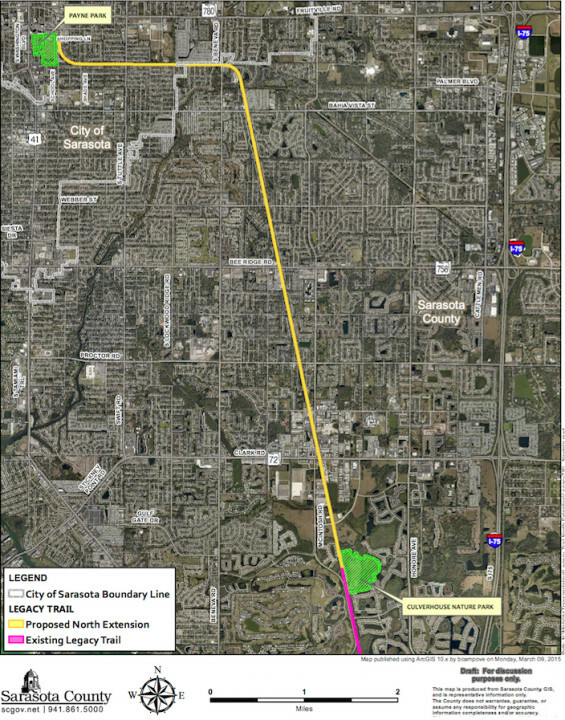 After the acquisition has been completed, county leaders plan to build a pedestrian and bike path connecting The Legacy Trail from its Palmer Ranch terminus to Payne Park in downtown Sarasota. More than 120,000 people annually use the Trail, county data show. Together with connections to the Venetian Waterway Park and the Carlton-Myakkahatchee Trail, The Legacy Trail extension project will connect Sarasota with Venice and North Port in South County, the release points out. Extending The Legacy Trail into downtown Sarasota is a top priority of the Sarasota County Commission. “With this grant from Gulf Coast, The Trust for Public Land can leverage it with our own [funds] and those of other private and public partners who support bringing The Legacy Trail into the vibrant heart of Sarasota,” said Doug Hattaway, senior project manager for The Trust for Public Land, in the release. “The downtown extension will expand recreational opportunities for thousands of families and neighborhoods and bring additional tourism revenue to our area,” he added in the release. The trust is based in San Francisco. In the most recent update to the County Commission, Assistant County Administrator Mark Cunningham reported on Oct. 25 that the county had failed to win a grant from the Florida Department of Transportation’s Shared Use Nonmotorized (SUN) Trail program, but that staff would apply again during the next grant cycle.